The centre has held exhibitions from their collection of photos, press cuttings and replicas. The archival materials held at The Centre have often been borrowed by other institutions to enhance exhibitions hosted by them. In 2006 The British Museum organised an exhibition on Tagore when they exhibited several items from the Tagore Centre. A photo album containing some rare photographs of Tagore aroused public interest. 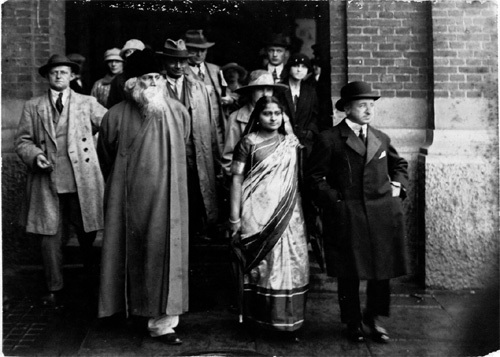 “Tagore and the British Press” featuring hundreds of press cuttings provided a deep insight into the intense scrutiny with which the British media covered Tagore’s visits to the UK since 1912. The exhibition toured New Jersey in the USA, Kolkata, New Delhi, and Dhaka. “The Wayfaring Poet”, an exhibition of photographs, opened in September 2011 and covered Tagore’s travels away from the Indian subcontinent. This exhibition was then shown at The Nehru Centre, Napier University in Scotland and The Scottish Parliament. Tagore was one of the most widely travelled persons of his age having travelled from Japan to Argentina, from Egypt to Russia. The photographs and the historical references to their context help to understand the world’s views on him. Very recently an exhibition at the Institute of International Visual Arts, London, named “Tagore’s Universal Allegories” by artists Anna Boghiguian and Goshka Macuga centred on the work of Rabindranath Tagore. This project featured two quite unexpected responses to Tagore’s legacy and suggested how his work and ideas still resonate with the artists of today. In their displays both artists drew on artefacts including books, documents, photographs and sound recordings from the specialist library of The Tagore Centre UK, giving the audience direct access to Tagore’s works and teaching.